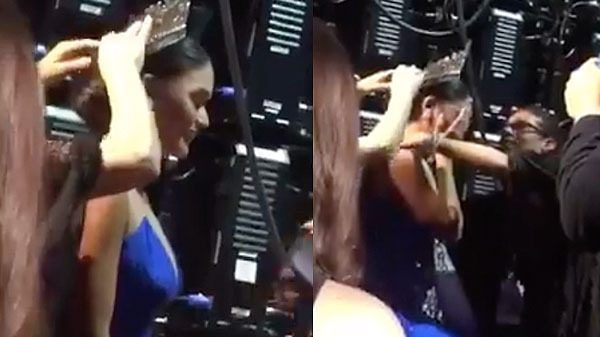 A video showing Pia Alonzo Wurtzbach from the Philippines shedding tears after officially receiving the Miss Universe crown and sash from the organizers backstage has gone viral. Following the Miss Universe 2015 massive mistake, crowned winner Pia Alonzo Wurtzbach from the Philippines chose to cry backstage. In a video posted on social media, Wurtzbach turned emotional when she officially received the Miss Universe crown and sash from the organizers backstage. “A very strong woman who choose to cry backstage… Simplicity, humbleness and beauty… Congratulations to the new Miss Universe – Miss Philippines, Pia Wurtzbach! You don’t deserve to be crowned backstage,” the video uploader said in the description. On Sunday, Pia Alonzo Wurtzbach’s winning moment was robbed off her after event host Steve Harvey crowned the wrong queen. Harvey mistakenly announced Miss Colombia as winner and Miss Philippines as runner-up. The host came back on stage to correct his error and de-crown Miss Colombia and announced Philippines as Miss Universe 2015.